I have a love-hate relationship with obituaries. To my college journalism professor, they were a teaching tool and one of the best ways to emphasize how important the 5Ws of the lede paragraph were to a newspaper story. His logic made sense, especially because the obituary desk was the first job for many newspaper reporters in my part of the world in the mid-1980s. I can't tell you how many obits I wrote that semester—he assigned them based on the number of grammatical errors he found in each individual assignment—but I know I dreaded attending each session of that class as much as I enjoyed the challenges it presented. Obituaries may have been successful as a teaching tool, but at that point in my life, I thought them a nuisance and little more than a service newspapers provided to the family of the deceased and to the community—a who-what-when-where-why captured in 400 words or less. Ten years after completing that newswriting and reporting class, I proofread the obituary my mom wrote about my dad and started paying closer attention to the weight each of those 400 words carried. I began to see that my view of the professor's assignment had overlooked the responsibility the obit writer has to the family and the burden the writer assumes in shaping the reader's knowledge of the deceased. It's no easy task to assume that responsibility, but I was surprised to find that the burden was offset with joy when I wrote my mom's obituary this past January. I realized that I was writing for an audience that has yet to be born more than I was writing for our immediate circle of family and friends. The details I included are only a starting point for the stories my brother and I will share with future generations. We'll pass along those stories so that others might come to know her, not by the dates etched on her gravestone, but by the life she led and the person she was. Isn't that why we record family stories? And why we write about motherhood and family? It's definitely one reason we continue to publish Literary Mama. We're pleased to share this special-themed Mother's Day issue and hope the words on these pages will inspire you to share your own stories with your family. Welcome to our May issue! Claudia was born in Amos, Québec, Canada. She traveled the world for some years in search of herself before returning home at the age of 24. Later, she worked with C.E.C.I, an NGO, in Guatemala. Her work consisted of building medicinal gardens alongside Mayan refugees returning from Mexico. She quickly realized she needed to paint these hard working women. 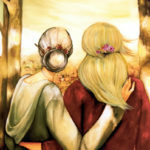 Her paintings represent the melancholic souls and inner strength that motivates these women. She also likes to explore the universal connection between mother and child.She has now returned to Montréal with her Guatemalan born son. She still paints full time, children's books and new images for her etsy shop. The intention behind every painting remains the same after all these years, love.